Peace Activist Uri Avnery: Red Card to the Settlers! In recent days, a growing global campaign is calling for soccer clubs based at Israeli settlements in the Occupied Territories to be banned from participation in the Israeli Soccer League. Should the Israeli Soccer Association fail to comply, Israeli soccer in general might find itself expelled from FIFA, the International Soccer Association. SO HERE we are. Either Donald Trump or Hillary Clinton will be our next president. “Our”? I am not a US citizen, and have no desire to be one. But I live in a world in which the USA is the sole superpower, in which every decision of the US administration has an impact on the lives of every human being. FOR ME AS a citizen of Israel, this impact is much greater than for most and much more immediate. I just saw a cartoon showing both Trump and Hillary crawling on the ground and licking the boots of an Israeli soldier. This is not too much of an exaggeration. Both candidates claim to be unwavering supporters of “Israel”. But what does that mean? Do they support all sections of Israeli society? (Latin Patriarchate of Jerusalem) Ramallah – On Tuesday July 12, 2016, Palestinian President Mahmoud Abbas awarded the Medal of Jerusalem to H.B. Emeritus Fouad Twal. The Latin Patriarch was welcomed in the presidential compound in the city of Ramallah in presence of Mr. Hanna Amireh, PLO Executive Committee member, Mr. Ziad Bandak, the advisor to President Abbas on Christian affairs, Mr. Majdi Al-Khaldi, the advisor to President Abbas for Diplomatic Affairs and International relations and a few Latin Patriarchate priests. A roundtable discussion with lawmakers and activists exploring the current status of Palestinian rights advocacy. Speakers include Representative Keith Ellison, Minnesota’s Fifth Congressional District, Dr. James Zogby, founder and president of the Arab American Institute, and Linda Sarsour, co-founder of the Muslim Democratic Club of New York and New York State Delegate to the DNC. Josh Ruebner, Policy Director for the U.S. Campaign to End the Israeli Occupation, will moderate the session. As Palestinians, we have always been blamed for having missed on many opportunities and generous offers that could have guaranteed our liberation and independence. It is always easy to claim so in hindsight. But the choices we have been offered were always either bad choices or worse choices. So no sane Palestinian would have accepted any of those offers, whether it was the partition plan of 1947 or the “generous offer” of Ehud Barak, or the ongoing peace negotiations under which new realities have been created and which had obliterated the Palestinian right of return in accordance to UN resolution 194 on December 11, 1948. But the history of the partition of Palestine and the process of the ethnic cleansing of its indigenous Palestinian population is well known by now. Thanks to the many historians, including Israeli historians, such as Ilan Pappe and others who refuted the Israeli claim that the Palestinians left their homes and towns in 1948, on their own and basically at the request of Arab leaders. Britain and the USA played a major role in the Palestinian Nakba in 1948, and despite all UN resolutions to redress the glaring injustice done to the Palestinians at that time, they continue to hinder any action towards granting the Palestinians their legitimate rights, including the right of return. That is why I felt that rating Mr. Obama should be related to the many missed opportunities during his two-term office as president of the USA. Without putting an end to that grave injustice, there will never be peace or security for the whole region. Clinton’s major opponent for the nomination, Vermont Senator Bernie Sanders [the candidate with a Jewish heritage who called for the US to acknowledge the human rights of Palestinians and take a more balanced approach vis-à-vis Israel and Palestine], graciously conceded and called for a unanimous affirmation of her nomination. Some of his delegates were not so gracious, threatening to cast their votes on November 8 for someone other than Clinton. Wall urges readers to ponder what happens when a third party throws a proverbial “monkey wrench” into a presidential race. On August 18, 1920, the U.S. Congress ratified the 19th Amendment to the U.S. Constitution, granting women the right to vote. On Thursday night, July 28, 2016, just short of 96 years later, former Secretary of State Hillary Clinton was nominated by the Democratic National Convention to become the next president of the United States. Almost a century after women gained the right to vote, a woman is now one election away from becoming president. From the West Bank, Mazin Qumsiyeh sends news regarding Palestinian Christians. We get depressed to hear from friends in Gaza of the continuing hardships and almost impossible life they live under Israeli siege. That siege does not seem to end as the Turkish government “normalized” its relationship with Israel (i.e. went back to being a partner in crime). We get uplifted by the indomitable spirit of resistance of the young people who don’t give up. We hear Bernie Sanders abandon his principles and support Hillary Clinton for President (she is a Zionist war monger and will not be much better than the lunatic Donald Trump). Dr Sabella (in white shirt) with DSPR Central Committee. © WCC/Claus Grue. World Council of Churches, July 12, 2016 – Every morning a cheerful and articulate man arrives at his office in East Jerusalem with at least a grain of hope. Dr Bernard Sabella has devoted his entire life to the rights of the Palestinian people. In his job as the executive director of Department of Services to Palestinian Refugees (DSPR), he encounters issues concerning the Palestinian-Israeli relationship daily. At the same time, he just wants to be an ordinary citizen in the country where he and his family have their roots, without constantly being associated with the Palestinian-Israeli conflict, which at times he feels does injustice to his identity as a Palestinian. 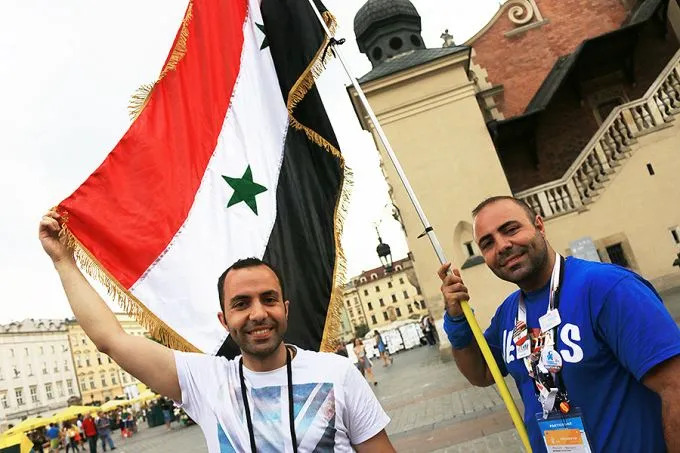 Al and Yousef Astfan are brothers from Syria who reunited in Krakow at World Youth Day after three years. Credit: Kate Veik/CNA. Krakow, Poland, Jul 28, 2016 / 12:04 am (CNA/EWTN News).- Among the hundreds of thousands of pilgrims at World Youth Day are two brothers, recently reunited. Yousef first attended World Youth Day in Madrid in 2011. Now he’s in Krakow with his brother, 25-year-old Al Astfan, a first-time attendee who loves the event. “It’s great. It’s such a great opportunity to meet people from all the world, in the name of Jesus,” Al said. Yousef explained his own thoughts about the massive Catholic youth gathering.